This post includes affiliate links, and I will make a small commission if you make a purchase after clicking on my link. When I'm shopping for fall decorations, I try to include a good mix of spooky/Halloween stuff and fall harvest decor. I look for pieces that will easily transition from Halloween to Thanksgiving. 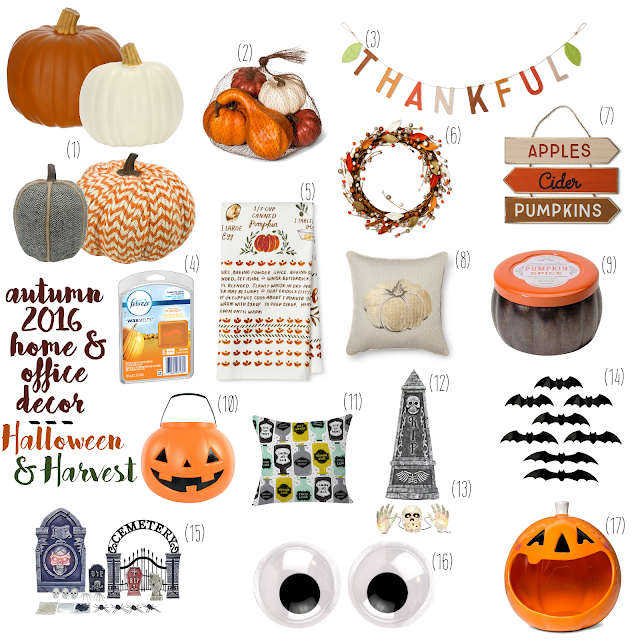 Pumpkins and leaves work for both , so just switching out some key pieces after Halloween keep your home looking festive! I love this keeping my home pumpkin-scented through November with candles and wax melts! This giant jack-o-lantern bucket is the perfect size to use as a large planter, and these googley eyes can easily change your door from boring to BOO with a shredded white plastic tablecloth for an easy-to-make mummy! And if you're looking to spruce up your yard quickly and inexpensively, this entire graveyard set is only $26! Right now, spend $25 on Halloween and save $5 or spend $40 and save $10. Or through October 22, save up to 25% on bedding, bath, rugs, throw pillows, and throw blankets. How do you decorate for fall? What are some of your go-to items every year! Leave links below, so I can see how you decorate your home!